At this time of year when the summer is already here, I see people smiling and being more friendly and open minded. I think the nature and weather makes us the kind of people we are. A long dark winter makes us quite tired and it feels bad to leave the apartment when it snows and the freezing wind is blowing. It´s like new beginning when trees get hint of green and birds come back from south. Temperatures start to be pleasant and you can even throw your extra thick winter coat away and start enjoying the warmth of the finnish summer that lasts like couple of days. During these couple of days we celebrate by being social and talking with our neighbours. We celebrate also midnight sun, juhannus as we say it in finnish. It usually rains and sometimes even snows but we are used to that and it doesn´t matter. We celebrate it and that´s it. We Finns are quite stubborn but hey that´s us. We probably couldn´t manage living here if our ancestors would have given up when the harvest was a disaster and they had to eat dry and hard bark. I think i might be typical Finn. I don´t know if i like it or not because some of these qualities we Finns seem to have are quite tragicomic. Like our personal space and that we feel uncomfortable when there´s too much people around us. And the awkward moment´s when you can´t decide do you say “Hi!” to someone you know but she/he isn´t really that close to you and more awkward it is when neither of you can decide and you end up to hide from this person because it would be the most awkward moment when you say “Hi!” but that person doesn´t greet you back and everybody else can see and hear. So hard to be Finn with “big” problems. And then we have of cource mämmi and other (very tasty) Finnish foods like salty liquors and rye bread. Sauna is also big part of our culture and it´s only place where Finns don´t care so much about personal space and you can talk about everything with your friends in the sauna. These are things that foreigners usually know about our culture and they ask if you really go to sauna with no clothes on and I say everytime that it´s true. 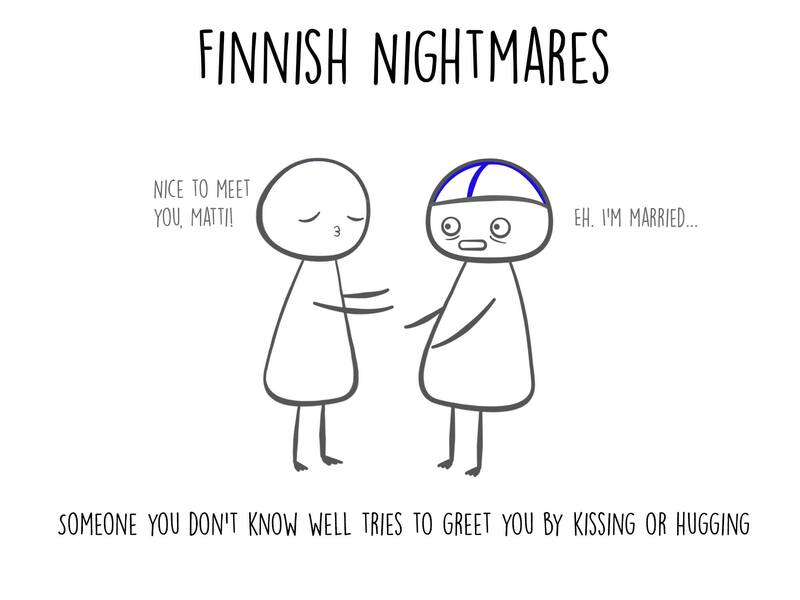 Their look is usually a bit embarrassed because they thought that finns are so shy. Not in the sauna. The image that comes to my mind when i think about Finnish summer. While traveling long time abroad, not meeting any people from your homeland, makes you think why you feel togetherness with people who come from same area as you, even thought you are still strangers to each others? My opinion is that you can feel the same with anyone, from anywhere in the world, because of other reasons, like same kind of interests or past or anything.. But still there is something special when you can start to speak your own language after a long time, talk about recent news from Finland and maybe have common friends or special places back at home. I think for Finnish people specially this is important, because we are such a small country, foreign people don’t always know much about us, and meeting another Finnish far away might be sometimes really rare. Street food in Vietnam. Made me feel homesick to my home town Rauma. My favorite memory about this subject is, when I was travelling in South East Asia. At the time I had traveled for about 1,5 months, and meeting only one Finnish before this. So there I was, in Thailand, traveling from Koh Tao to Bangkok by ferry and night bus. When we got to bus, somehow there was me, two girls traveling together, and two guys, all at the back of bus. We chatted for a while, and when it got late we could say good night in Finnish. That felt really special and made me feel cozy in this really uncomfortable bus. Some personality traits that I appreciate especially in Finns, are honesty, accuracy and keeping what they promise. Sometimes you can hear that Finnish people are shy, even rude for strangers. But I think it depends on you. If you smile to Finnish people, they will smile back, if you ask for help, they sure will help you. Sometimes while travelling, you can find something really silly that only you can understand. Here is one good example I found from South Korea. The first thing that comes to my mind when thinking about ‘’Finnishness’’ is the need for own personal space. Finns are so private about their lives that even their neighbors don’t know each other. I’ve even heard personally from another Finn that he can’t stand using public transportation if it is a rush hour, so in the worst case scenario he’d rather waste his money on a taxi than take a bus. Funnily enough all these rules stop existing once you enter a Sauna with a bunch of Finns (or when a Finn man is drunk). I am not that typical a Finn myself, I don’t like salmiakki (Finnish ‘’delicacy’’), I don’t watch sports (IE. ice hockey) and I am annoyed how much personal space Finns take in a public transportation. The worst is the regional train where there is no seat reservation, and there are usually three chairs in one row. What does a Finn do? Either takes the window place and put all his belongings on other benches, or if only the window seat is taken, he leaves the middle bench empty so no one can sit there. Finns efficiently render 50 percent of the benches useless. This next story actually happened to me couple days ago. I was on a bus that was rather empty, many seat rows completely available, yet someone decided to sit next to me. My little Finn inside of me woke up immediately and wondered why this person would sit right next to me. It struck to me when I looked at him, he wasn’t a Finn. After a short moment he started talking to me, and asked directions. Luckily enough he would need to stop at the same station as I, so instructing him was not a problem. Since the journey was still going to take almost an hour, we started to have a conversation and I found out he is a foreign exchange student from Pakistan and studies in the Tampere University of Technology. It was a rather pleasant conversation and certainly more interesting than the one that I’d get staring at my phone for an hour. One more not so Finnish-like thing he did was ask my phone number so he could add me on WhatsApp. Rather odd to me just because of one conversation on a bus, but I decided why not. One more example that the word ‘’Finnishness’’ brings into my mind? Writing this kind of rant about Finns (Finns love ranting about other Finns, especially on the internet) and realizing it myself when getting to the end of it. This is like my first blog post, but I try to write something, I’m not a good writer but let see what happen. So finnishness. First I could say that all Finnish people are different and we are all own individuals. But everyone of us are a bit similar, because we are Finnish people. Usually is thought that Finnish people are quiet and inward but reliable people. If you for example buy something, usually you get what you have ordered. Usually is thought too that Finnish have always a light hair and blue eyes, okay that is overall but we have also people who has for example brown hair and brown or green eyes. I have heard too that foreigners said that Finnish are friendly and neat. If you are for example abroad in a hotel and there is many Finnish people, you will see it. The place where is Finnish, there is usually clean. My all experiences abroad are good. For example often when I am abroad and some people ask of me, where are I am from and I said that I am from Finland. They are interesting of that and will say like that’s nice. Always when I am abroad, I feel that is fine to be Finnish. But of course I could say that also when I’m in Finland I’m proud of to be Finnish. So I could say that finnishness means for me that i am a proud Finn. I always laugh at the characteristics people say about the Finnish thinking “yeah, that´s true, but that´s not me”. But in fact, that´s more me than I care to admit. I like my space. My space is my space. If a salesperson gets on my skin I fleet immediately thinking afterwards “I really wanted that blouse..”. Even if there´s rain pouring down if I see three people at the bus shelter I think ” Damn it, it´s full” and stand in the rain with my flimsy umbrella. Don´t even get me started on swimming centers and their lanes, I mean if a lane has three people swimming in it, it is full. Finnish perseverance I have to my very core. So does the whole of my family. If tourists could´ve seen me and my dad last summer putting up a tin roof on our summer cottages guest house in full thunder, pouring rain and insane wind, there probably would´ve been a few photographs of “crazy Finns” online. I also have the characteristic of a Finn of being too shy with direct complaints. (I mean we as a nation can certainly dish it out online but when push comes to shove of giving complaints face to face, we become as silent as a monk in a monastery.) I mean how often do you see a Finn turning back a plate at a restaurant because there was something wrong with the food? I have never, including my own actions. One time I physically gagged from the food given to me at the restaurant and I still didn´t say anything. Just stopped at a grill on my way back to the hotel. Finns are known for their honesty. So am I. I could not lie if my life depended on it. My friend once saw me lying in a text message for Gods sakes, who does that? Usually you can see if a person is lying from their expressions or body movement but apparently I can´t lie even with emojis. Is there a Finn among us that can praise their own amazing qualities weeks on end? I have never been able to do that. Job interviews are the worst. “What are your best qualities?” “Mmmm… Well… I get along with everyone… and I am a hard worker….” Seriously? Came up with that all by yourself? You are willing to work with others AND actually work if you get this position? Why hasn´t someone snatched you up already? But hey, what can you assume from people that live kilometers away from their closest neighbors and can go through an entire conversation with grunts? Just kidding. Culture is culture, but peoples characteristics are their own. Some Finns fit the categorization of a Finn to the T, some are like from a another planet. Me, I´m somewhere in the middle of those two. PS. I also googled “characteristics of a Finnish person”. Top 3 that stood out were “Finns make good heavy metal music”, “Finns have a high rate in suicides” and “Finns are pale”. Such positive characteristics of us nordic climate Finns. Well I don´t listen to heavy metal so I wouldn´t know and I personally have no interest in jumping off buildings. And the pale thing. You come and try to stay tanned in a land where sun shines three months of the year if you´re lucky. Just saying. PPS. Many finns are known for being sarcastic, including myself. So don´t take me too seriously. Found so many these below online. Spent almost half an hour scrolling through these. The last one crystallizes them all. I think that this is the first blog I have ever made so I’m sorry if I’m kinda clumsy with writing and stuff! So something about being Finnish. The ealier thing actually is only thing that fits me really well as Finnish because many have said that I’m really not like the stereotype Finnish guy. I think that there is many negative stereotypes about Finnish people example they don’t want to talk about themselves, guys don’t like to dance or sing if there is any unfamiliar nor familiar persons near them and they has really big personal space! I’d rather say that Finnish people just “warm up” to others a bit slower so just take your time and get used to them a little by little. That should fix a lot and you’ll avoid misunderstanding!